Indian cities have witnessed highest growth for any urban cluster in the world with Mumbai and Delhi topping the list. In this photograph we see a homeless Indian man in the middle of the urban traffic in Mumbai, India. See the Nat Geo Challenges that photographer Kristian Bertel has participated in. Rapid rise in urban population, in India, is leading to many problems like increasing the amount of homeless people, something that Kristian Bertel has portrayed here in this Nat Geo Challenge called #UrbanTransit. A rise that also decreases the standard of living in urban areas, also causing environmental damage. It can be argued that urbanization impacts the migrant himself at multiple levels. As our cities expand, transportation networks will evolve with them, to cover more ground and carry more people. Stations and airports are getting retrofitted with sustainable design and upgraded with high-tech features. For this challenge on Nat Geo Your Shot, we should photograph how we get around our city using innovative urban transit solutions subways, buses, BRT systems, trains or travel to other cities. They want to see the future of urban commuting. But in this photo challenge the photographer also wanted to show how urban environments with traffic are effecting its people. On the otherhand, it poses a big challenge for the cities that are growing due to migrant population shifting in. How will cities support in terms of resources, land and space. Squeezing your way through mammoth traffic congestion and still making it to work on time every morning is no small feat, a skill that the people of India are fast picking up, not by choice but by compulsion. As the number of cars and two-wheelers on the road is increasing, commuting from one part of the city to another at any point of the day has become a matter of concern for everyone. While the urbanscape continues to expand with new road networks being built and neighbourhoods being created, town planners and other government authorities have still not been able to put a consolidated method in place to reduce traffic gridlocks, which leads to more road fatalities and pollution and from the urban transits. As residents of the city, if it in India or in the western countries, we are equally responsible for finding solutions to an issue that is bothering all of us on a daily basis. There is a lack of space to build wide roads or infrastructural facilities in India. Indian cities have witnessed highest growth for any urban cluster in the world with Mumbai and Delhi topping the list, while we can raising questions over insipid urban development. Modern services on rapid transit systems are provided on designated lines between stations typically using electric multiple units on rail tracks, although some systems use guided rubber tyres, magnetic levitation or monorail. The stations typically have high platforms, without steps inside the trains, requiring custom-made trains in order to minimize gaps between train and platform. They are typically integrated with other public transport and often operated by the same public transport authorities. However, some rapid transit systems have at-grade intersections between a rapid transit line and a road or between two rapid transit lines. It is unchallenged in its ability to transport large numbers of people quickly over short distances with little use of land. Variations of rapid transit include people movers, small-scale light metro, and the commuter rail hybrid. The photographer chose to show a photograph of a homeless man just in the middle of the traffic in Mumbai in India. Homelessness in India in urban areas has been a problem for centuries, causing the average family to have an average of five generations being homeless. Homeless people can either be described as living on the streets, in prison, in an institution, or sleeping in other places not meant to be adequate nighttime residences. 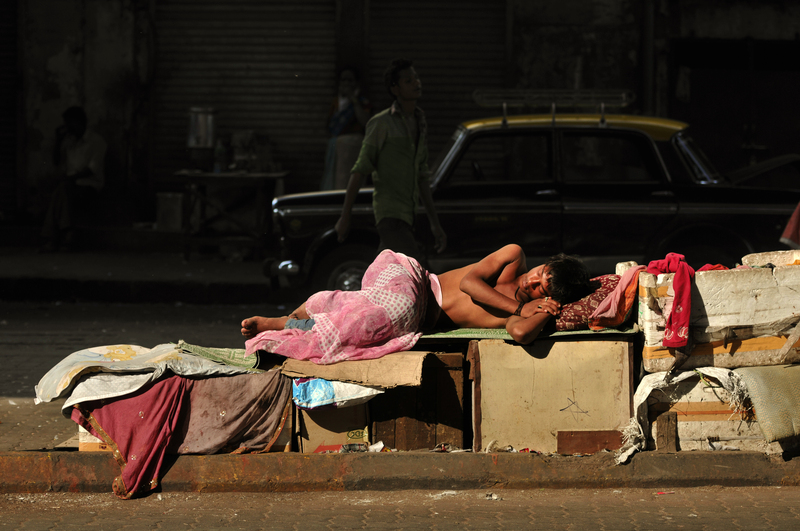 In this photo an Indian man is sleeping in the Bhuleswar area of Mumbai.